Home / Android / Android Apps / Android L – the must experience! Android L – the must experience! With Android Lollipop the possibilities have increased for the Android user. Google has introduced many new features along with some design changes and costume animations. Today, in this post, we are going to look for five tips which will help you make maximum out of Android Lollipop. Hope you will enjoy the post and tips will bring you more knowledge about your devices. For all those who love playing games then this tip is for you. You’re probably used to the Android Lollipop where you tap on the version name in the about phone/about tablet part of the settings menu. Well this is no different in Lollipop but taking it forward here Google has introduced a game in it. 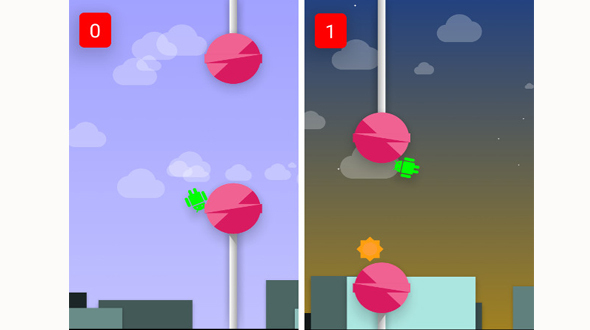 If you tap the image of the lollipop multiple times, then long press it you’ll load up an Android themed mini-game which is a nod to Flappy Bird. Beware it’s not easy to win this game. With more technology packed into Smartphones and tablets, the settings menu has grown and got ever more complex. To make it simpler Google has introduced specifically search the settings menu in Android L (iOS users will have this in upcoming iOS9 in coming days) – it’s fast and easy if you know what you’re looking for. Tap the magnifying glass to do a search for whatever you are looking for. Notifications now show in the middle of the lock screen which is a good thing, but not if you don’t want juicy details on display to everyone. Under “Settings > Sound & notifications >” – When device is locked you can choose to hide sensitive notifications. Developers can add this into app so they are not on show. You can also switch off lock screen notifications completely here. It might be handy sometimes and you might be used to it, but you don’t have to put up with newly installed apps appearing on the homescreen (often creating a brand new panel). To switch this off, open the Play Store app, head to Settings and untick the ‘Add icon to Home screen’ box. Third party flashlight/torch apps have been very popular and a must download, making handy use of the camera’s LED flash – for devices with one anyway. Well Google’s has made this a standard feature of Lollipop, so you don’t need an app anymore. The flashlight is found in the notifications bar. Hope you have liked the tips, if you have some tips with Android L share that with us in comments section below.